Gregory Poole offers the largest fleet of air compressors for rent in the Triangle. Our staff is well trained in all applications for compressed air. 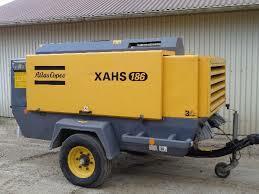 We offer a large fleet of industrial and construction compressors from Sullair and Atlas Copco . Being the largest provider of rental air in the Triangle gives better availability than anyone. We rent and sell oil-free and oil-flooded air compressors that range from low pressure 70 CFM to high pressure 2232 CFM from leading manufacturers, Sullair and Atlas Copco. We have the expertise to ensure that you get the proper unit – whether you just need a mobile compressor to run work tools or need to power a high-quality, big air application. Contact us today to learn more about our air compressor rentals.